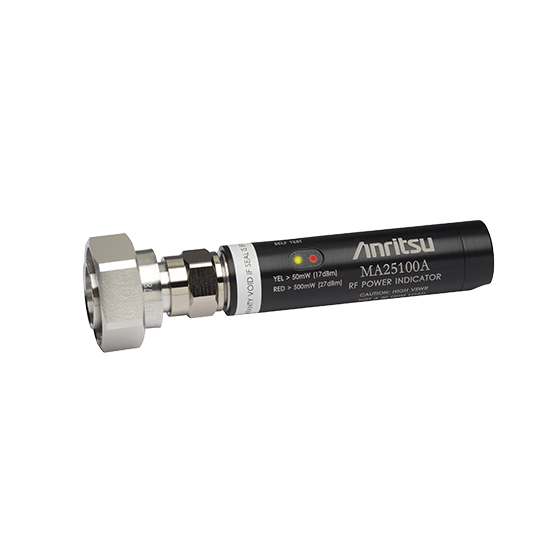 Use the MA25100A RF Power Indicator to determine if a connector is "live" with RF power that could damage sensitive measuring equipment from 400 MHz to 4000 MHz. Mate the MA25100A to the connector in question and it will indicate the presence of high-level RF: Yellow LED if RF > +17 dBm (50 mW) or Red LED if RF > +27 dBm (500 mW). The MA25100A can withstand RF power levels up to +50 dBm (100 W) from a 50 Ω source. The MA25100A has a very high VSWR and should not be used as a 50 Ω termination. The MA25100A RF Power Indicator is always on and always ready. Its self-contained battery can last for years with normal use and is field-replaceable. A "self-test" button lights both indicators (red and yellow) if internal circuits and battery are functioning.